The author Ramakanth Jonnavittula is a Ph.D in Mathematics and in Business Management. He is a Fellow, Andhra Pradesh Akademy of Sciences. 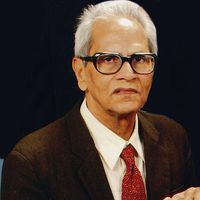 His drama ‘Kalachakram’ won 4 awards, including the second prize for the script, in the ‘All India Andhra Natakakalaparishattu’ competitions in 1960. His story ‘Kanuvippu’ won the second prize in the competitions conducted by the A.T.A. in 2008. He translated into Telugu Arthur Miller’s “Price” after obtaining author’s permission. He is the author of 5 Print books, one Audio book and 13 E books.